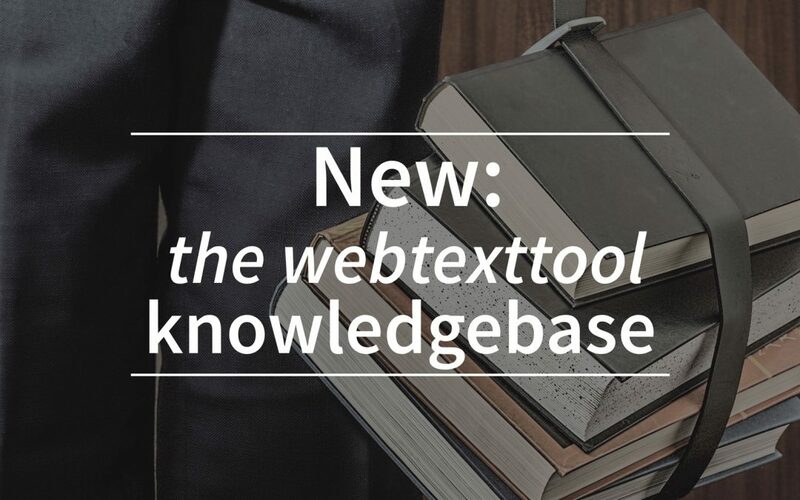 In the latest release of webtexttool a knowledgebase is launched. In this knowledgebase, users will find articles about using webtexttool, SEO and copy writing. Besides the articles there are short informative videos about SEO in the base as well. Webtexttool is a very versatile tool. “It’s really important that our users get to know all the facets of webtexttool in the trial period. That is why the category ‘getting started’, in which the basic essentials like keyword analysis and create a page are described, is an important element in the knowledgebase” marketing manager Lisa Paauwe explains. Besides providing practical handles, the knowledgebase is also launched to amplify the overall vision of webtexttool; make the – often complex – SEO knowledge accessible. That is why there are more articles about broader SEO topics, like linkbuidling, and videos in the webtexttool knowledgebase as well. The knowledgebase is never finished. Articles are being added and edited to keep all the information up to date. In the dynamic world of SEO this is necessary. For example to keep up with the changing algorithms of search engines. Webtexttool users can reach the knowledgebase via the ‘help’ button in the webtexttool app. If you don’t have an account, create one for free!